While in Cambodia for the Horticulture Innovation Lab’s 2016 annual meeting, I arrived a few days early to visit a project that I have been advising remotely regarding postharvest practices. 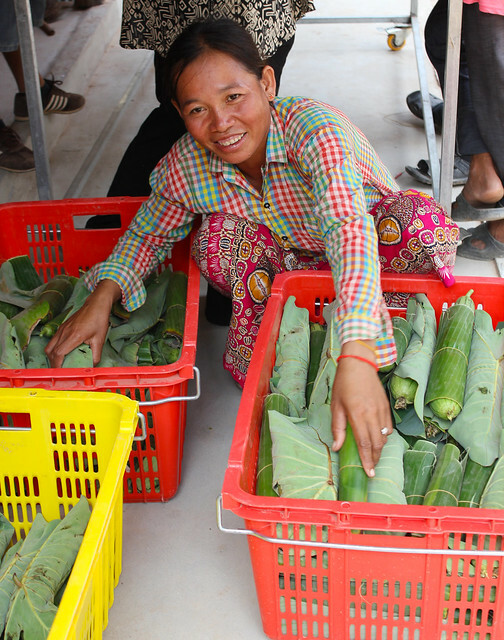 The project, led by Manny Reyes of North Carolina A&T State University, is working with women vegetable farmers who have been successfully practicing conservation agriculture in the Siem Reap region. As a postharvest specialist, I was most interested in how the farmers are using some of the low-cost technologies that the Horticulture Innovation Lab is promoting around the world. Specifically, the project has built a cool room equipped with a CoolBot, as well as a grading table and a washing station in collaboration with Kasetsart University of Thailand and the World Vegetable Center (AVRDC). They are also working on a “tuktukbot,” which is a motorbike and trailer equipped with a cooled compartment to transport the produce for sale, maintaining the quality of the fresh produce during hot days. During my visit I had the chance to meet the local project technicians Ren Ry and Sel Rechaney as well as local farmers. Together we explored farms, storage locations and different transportation vehicles, so I could monitor the trip of fresh gourds and chili peppers from harvest to grading, packing and storage in order to identify postharvest practices they could improve. From left, farmer Eang Chakriya and technician Sel Rechaney show UC Davis researcher Angelos Deltsidis how they harvest sponge gourd and wrap the vegetable in banana leaves to pack and transport. The first stop was at the sponge gourd and chili pepper plot where the owners were harvesting their produce. We observed their harvesting techniques and asked questions about their crops. It was interesting to learn that in Cambodia it is easier to sell freshly harvested produce rather than cooled produce (even though cooling can better maintain produce quality). This is due to the perception that cooled produce is older and potentially imported from neighboring countries. Like many consumers elsewhere, many Cambodians are also interested in buying locally grown produce from farmers they can trust. The sponge gourd harvesting was a laborious process with the farmers wrapping each individual gourd with banana leaves, strapped with rubber bands. This way the fruit is less damaged during handling and transportation. Farmer Brap Yart sorting the damaged and undamaged gourds, after transportation by tuktuk over dirt roads to the packing shed. Then we followed the vegetables to the packing and storage facility of the farmers’ cooperative where local women were grading produce as well as weighing and packing some of it in plastic bags. The CoolBot-equipped cool room was in the same area so the vegetables could be moved to lower temperatures immediately after the grading and packaging process, ensuring that it would lose less water and remain fresher. The group was using USAID-provided plastic crates for easier and cleaner storage of the crops that were easily stackable in the cool room. Even though these gourds are wrapped in leaves, scuffs from the crate and bumpy ride were visible on the skin of the fruit. When the tuktuk (a motorbike with trailer) arrived with freshly harvested produce at the packing shed, we started inspecting the vegetables that had gone through their typical trip from the farm to the packing facility. The chili peppers had no visible defects other than being warm thanks to the tropical weather of Siem Reap. On the other hand, the sponge gourds had visible damage due to the vibration of the tuktuk driving along the bumpy, unpaved roads between farms. 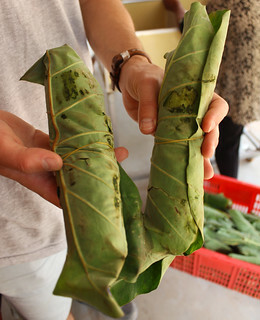 Even though the gourds were wrapped in banana leaves, scuffs from the sides of the crates on the skin of the fruit were visible. The farmers mentioned that the market price of these gourds would be diminished since people prefer the unblemished fruit and would pay very little if any to purchase imperfect sponge gourds. It is interesting to note that even in the developing world, many people prefer perfect-looking fruits and vegetables, which are not always the tastiest or the freshest. So reducing damages that occur during harvest and transportation would significantly reduce postharvest losses and increase farmers’ income without the need to intensify their field production. Appropriate postharvest practices help smallholder farmers sell what they already produce at a better price while reducing food losses.